A supporter holds up a sign of the DREAM Act. 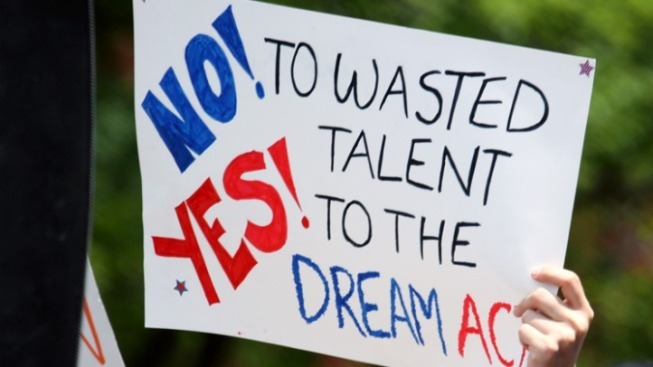 The Dream Act is now in the hands of Maryland voters. The state’s Court of Appeals decided the law will appear on the November ballot. It’s the first time in 20 years that Maryland has had a referendum on a state law. The Dream Act, passed last year, allows illegal immigrants to get in-state tuition to Maryland’s colleges and universities. There are conditions to the cheaper tuition. Illegal immigrants must first prove they’ve attended Maryland high schools for at least three years and have parents who filed taxes. They could then go to community college and earn their associate’s degree. After that, they can transfer to a four-year institution. Governor Martin O’Malley, who supports the Dream Act, said he and other supporters are building a campaign to encourage voters to uphold the law. Unlike the national version of the Dream Act, which failed to pass the Senate in 2011, the Maryland version will not include a path to citizenship for illegal immigrants.